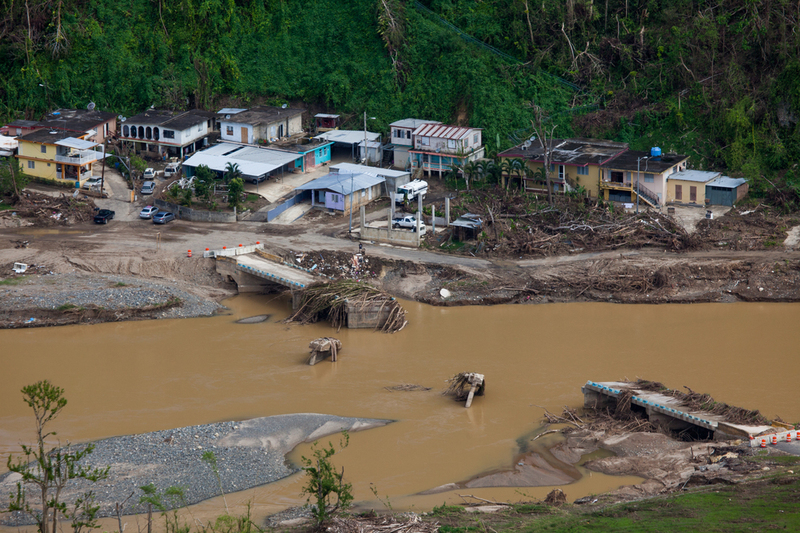 Roads, houses, and the bridge carried away by flood waters of the Rio Charco Abajo. (FEMA.gov)In September 2017, two Category 5 hurricanes devastated much of the Caribbean, including the U.S. territory of Puerto Rico; first, Hurricane Irma, and ten days later, Hurricane Maria. Many slopes on the island were already saturated when Maria made landfall on September 20, 2017. The tenth most-intense Atlantic hurricane on record, Maria inflicted widespread damage, numerous fatalities and created an ongoing major humanitarian crisis in Puerto Rico. Understanding how extreme events such as hurricanes, earthquakes, tsunamis and tornadoes affect civil engineering infrastructure is crucial to both the design of new structures and the retrofitting of existing ones. Daniel Pradel, professor of practice in the Department of Civil, Environmental and Geodetic Engineering, visited Puerto Rico in early November 2017 as part of the Geotechnical Extreme Events Reconnaissance (GEER) team, a program funded by the National Science Foundation (NSF). He and his fellow experts assessed damage to many of the island’s buildings, dams, slopes, lifelines and bridges. Professor Pradel has considerable experience as a consulting, geotechnical, engineer and has participated in several post-disaster teams, including the 2015 Ghorka Earthquake in Nepal, the 2011 Tohuku Earthquake and Tsunami in Japan and the 1994 Northridge earthquake in California. 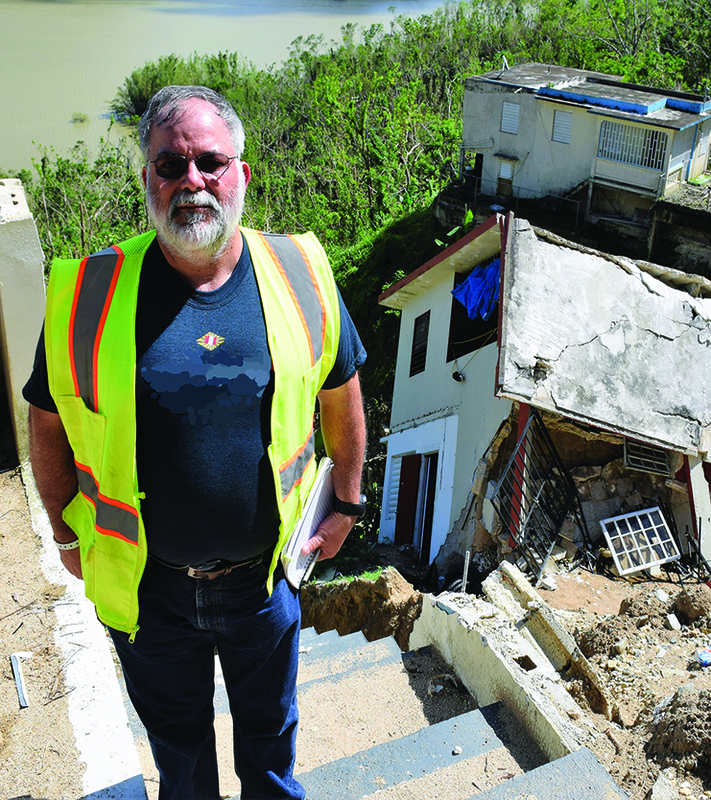 Pradel inspects landslide-affected homes along Logo dos Bocas during the GEER mission to Puerto Rico.Sponsored by the NSF, the GEER Association's intent is to turn "disasters into knowledge" by collecting important, perishable post-disaster data that engineers, scientists and government officials can later use to improve the design and safety of infrastructure. Upon arriving at its destination, the team found the damage to infrastructure to be widespread, which restricted access to sites with critical infrastructure. "It is difficult to bring relief to people and to implement repairs,” Pradel said. He observed landslides, rockslides and debris blocking bridge spans and culverts that created debris dams. The buildup of water behind these debris dams resulted in overtopping of bridges and damaged their columns. High velocity water flow resulted in major scour that eroded bridge abutments and dam spillways, as well as washed away roads, and utility line destruction. "The power grid is in shambles," said Pradel. "The amount of destruction is on par with what I observed in Japan, after the 2011 tsunami." Pradel is confident that the lessons learned here will help practicing engineers prepare for future extreme events, but knows that, in the meantime, progress on this Caribbean island will come slowly. "Temporary repairs are being made but the long-term rebuilding of Puerto Rico is still to come." The team's findings will be published by the Geotechnical Extreme Events Reconnaissance organization. Read this and other reconnaissance reports on GEER's website.